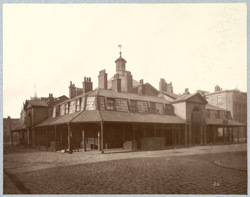 "Oxford Market was built about 1724, but not opened till 1732 (Allen's London, iii., 25). In Strype's Stow (1754) it is said to be 'not much resorted to at present,' a condition in which it seems to have remained till its demolition in 1880...Dr. Johnson at one time lived at No. 6 in this same street, then on the verge of London towards the north."